PeopleHR is ideal for small businesses looking for an affordable web-based HRMS that can accommodate their needs as their business grows. 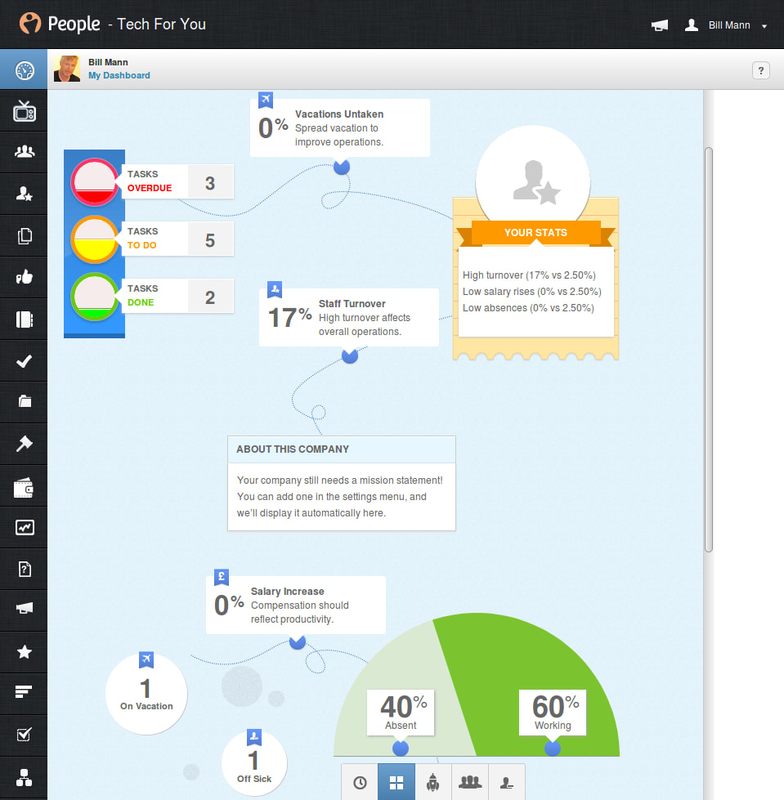 PeopleHR is an affordable web-based HRMS designed for small and medium-sized businesses. The system is capable of scaling as your organization’s needs grow, since you can easily add additional modules as your HR department's needs change. While we've found PeopleHR's UI to be a bit more confusing than other competing HR management systems, PeopleHR includes several training options to ensure your staff can quickly become productive with the system. Is PeopleHR right for you? User interface can be overwhelming for new users. System experiences occasional outages, which means that the system would be inaccessible during that timeframe. Mobile app is less robust than desktop version. Per-employee pricing varies depending on what functionality you need. Pricing ranges from $3-$7/employee per month. Free trial (no credit card required). Founded in 2014, PeopleHR is a UK-based company that provides a web-based HR management system for small and medium-sized businesses. The product is designed to help streamline your business's HR department by automating various HR functions and integrating them into one unified system. PeopleHR is not a one size fits all system—companies can select from 5 different plans at various price points, so you only pay for functionality that you need. While all plans include the core HR functions (known as HR Essentials), the more expensive the plan, the more features you'll have access to. This makes it a bit harder to evaluate the system as a whole, but gives you the flexibility to buy what you need now, and add capabilities as you need them. We like that PeopleHR offers a free switching service to help you transition data from your previous HRMS for free. In addition, each company that uses PeopleHR will be assigned a dedicated Account Manager to help facilitate your transition. In addition, People HR includes a gamified system of self-directed training missions. The 10 missions teach your team about different HR activities that can be performed with PeopleHR, rewarding them with a badge when they complete each mission. The badges are added to employee’s profiles in the HR system, bringing them recognition from their fellow employees while adding a little fun to the work day. Though there are many benefits of web-based software, whenever you use a web-based system, if their servers ever experience downtime (or if your Internet connection goes down), you'll be unable to access the system. PeopleHR has occasionally suffered downtime, which can be a negative for businesses that require very high availability for their HR software. You can access PeopleHR's server status, as well as see past issues they've had, through their status page. For most small and medium-sized businesses, the outages are rare enough that they are more of a nuisance rather than a dealbreaker. Below, we'll discuss the key features of PeopleHR, and how they can benefit your business. We’ll start with the HR Essentials module, since this will be part of any PeopleHR plan you purchase. Then, we’ll look into the other major components of People HR, which can be purchased as part of the Team, Professional, Elite and Enterprise packages. This is the core module of PeopleHR, and it includes much of the functionality that you'd expect from an HRMS, including employee management, time off calendars and expense reporting. HR Essentials is included in all PeopleHR plans, but can be purchased on its own for $3/month per employee. 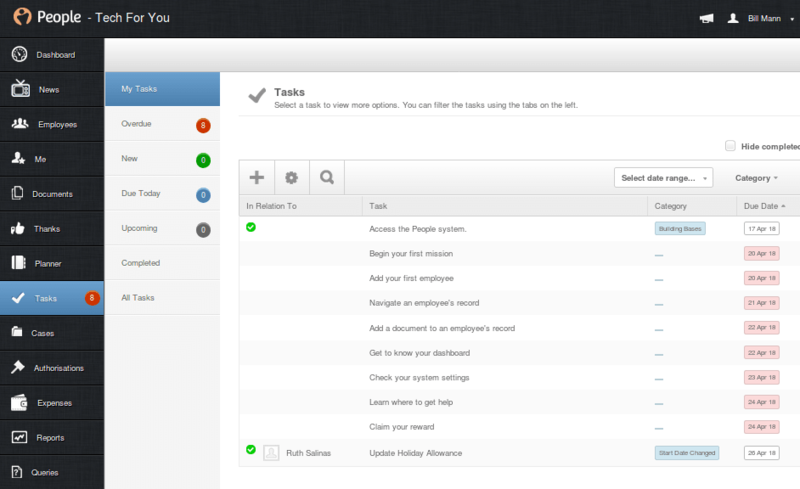 To help manage employee information, PeopleHR displays key information about your workforce in the a dashboard. 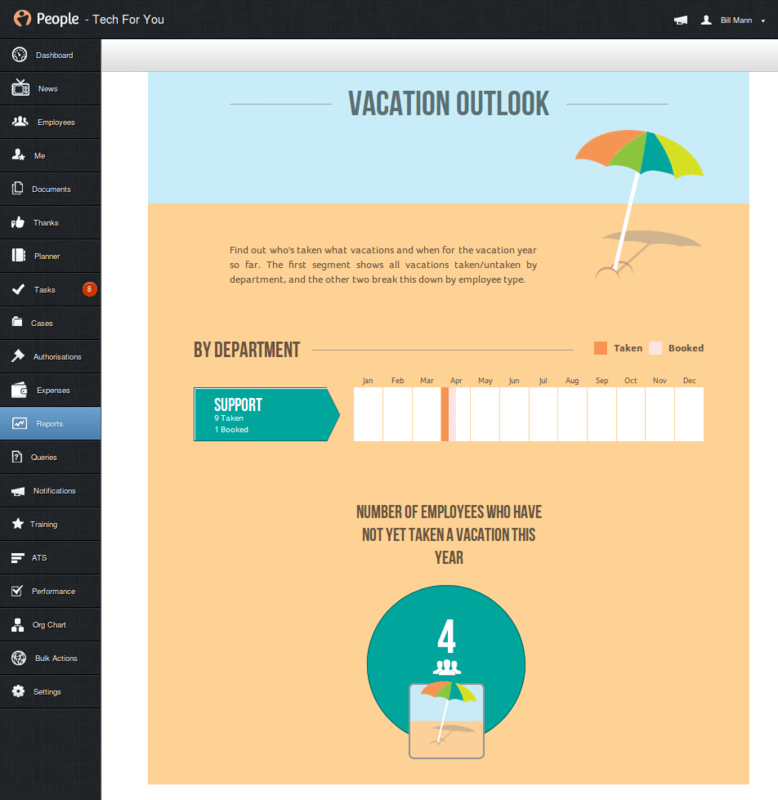 Though the dashboard is colorful and contains a lot of useful information, it can be a bit overwhelming for new users. The Dashboard can contain both company data as well as personal employee data, such as how many vacation days you have remaining, or how many open tasks you have. A row of buttons along the bottom of this screen allows you to zoom in on some of this data, or display additional dashboard data. HR Essentials also includes a complete employee database where you can create new employee records, and import existing records from your old HR system. You can customize this database by adding your own information screens, and can store an unlimited number of documents in it. The Planner portion of HR Essentials allows you to see when employees are taking time off, approve time off requests, and block time off on certain days to ensure sufficient staff availability. A built-in absence tracker can notify you of attendance problems and deal with them as soon as possible. PeopleHR also includes mobile apps for Android and iOS to help employees manage their information on the go. Employees can use the apps to submit expenses and request time off, or sign documents. However, the app does crash occasionally, which can result in a frustrating user experience. Users also report having difficulties submitting expense reports. The app has fairly low ratings on the Google Play Store and on iTunes, with a 3.5 star rating, so is not yet as convenient as the web-based experience. However, the app gets updated frequently (roughly once every month), so the PeopleHR team is actively working to improve the app experience. To attract candidates, the ATS helps you create and publish job postings on your website, as well as on third-party job sites. To identify the best applicants, PeopleHR's ATS makes it easy to review each candidate's qualifications and rank them based on your organization’s needs. 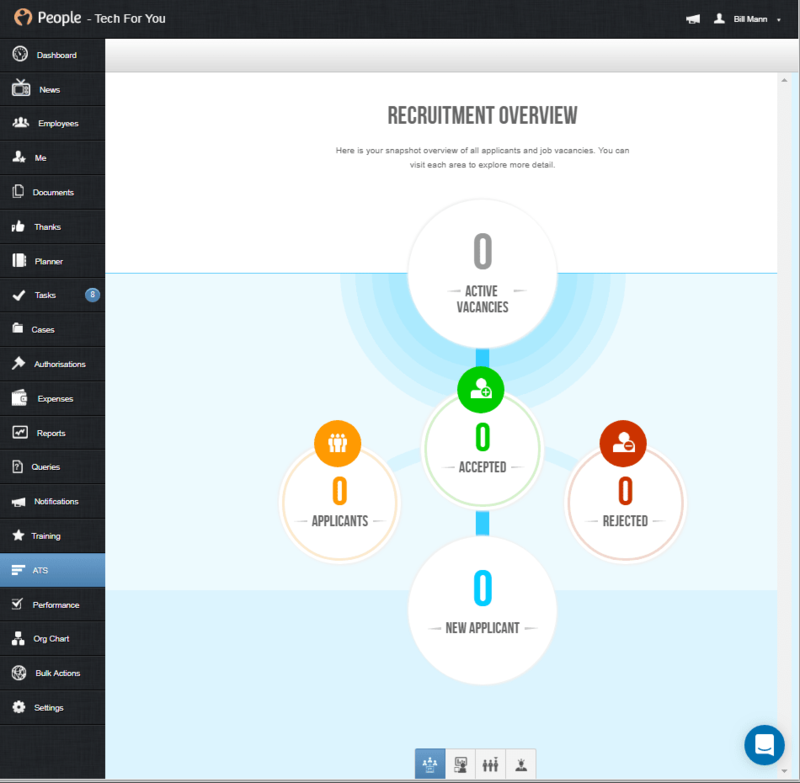 You can simply drag and drop to move candidates through the process. To recruit the best candidates, you can further analyze the data you have on each applicant, and also review feedback from other hiring managers, by creating a shortlist of the best prospects. Once you have your ideal candidates selected, the ATS makes it easy to email them without ever leaving the system. The performance management module is all about motivating your staff to reach their specific goals and improve their professional development. Specifically, this module helps you deliver employee performance reviews that are customized to your employee's and team's specific goals. To get the most accurate and fair reviews possible, the module lets employees and managers work together on reviews, and incorporate 360 degree feedback from their colleagues. The drag and drop interface makes it easy to prioritize goals for training and development. Once all the reviews and feedback are collected, you can compare the scores of each employee, so that you can identify your best performers, and also identify areas for improvement. You can also analyze performance over time by using easy to follow graphs of individual and group results. This module is designed to upgrade your HR reporting from charts and graphs of basic information. It features a collection of pre-made reports that highlight information like which departments have the highest-earning employees, how much vacation time is taken by department, and the hidden costs of things like desk space and employee time spent surfing the web. You can create reports that are designed to draw attention to the most important information. This can boost their impact as well as your status within the company. When you need information that isn’t included in one of the pre-made reports, you can use the query tool to generate a report on any information that can be found within the system. 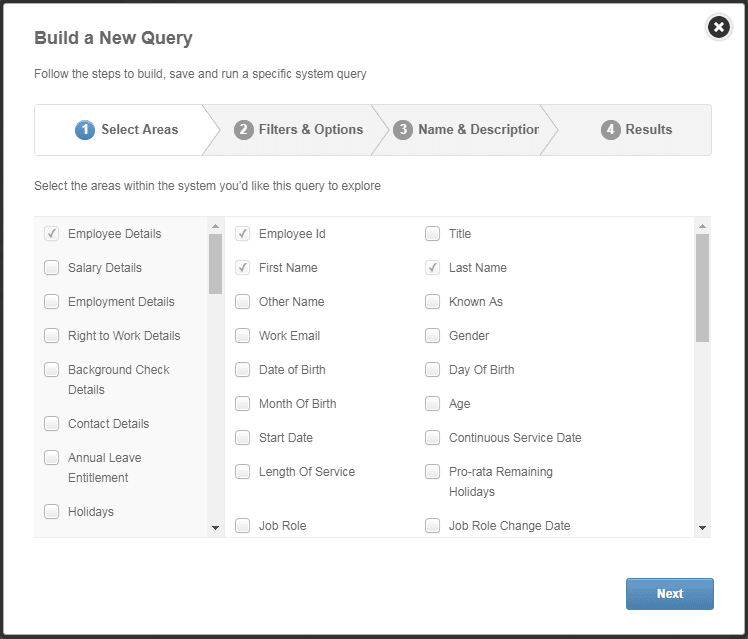 The query tool has over two dozen built-in queries. More impressive, you can easily use this tool to create a simple report on any piece of data that exists within your system. The most expensive PeopleHR plan gives you all the components of the system, including the Ripple Workflow Engine which enables you to create custom workflows to automate repetitive HR processes, and to standardize processes. For example, you can create a custom workflow for new hires, which gives each new hire a list of tasks that should be included as part of their onboarding. Each step will then be displayed in the Workflow Dashboard. PeopleHR supports many integrations with popular products that you may already use in your business. These integrations make it so that you can effectively have one system manage all HR components of your business. For example, PeopleHR's integration with Google Drive enables you to upload documents from Google Drive or Google Docs into PeopleHR, rather than having to upload important documents manually. These integrations can help boost the efficiency and productivity of your organization, while enabling you to seamlessly use other products that your business needs in addition to PeopleHR. PeopleHR's integrations are particularly strong when it comes to Payroll, Single Sign On (SSO), and productivity apps like Google Docs, Microsoft Word and Zapier. People HR provides a scalable and customizable HR solution for small and medium businesses around the world. Replacing your old manual HR processes and record-keeping with an integrated solution like this can free up your HR staff so they can focus more on higher-level strategic projects that can benefit the company. As is implied by their names, the 5 plans of People HR (Starter, Team, Professional, Enterprise, and Elite) give you the ability to adjust the cost and complexity of your HR solution to the current needs of your company. You can pay for what you need now, and move to a more powerful and more expensive level only when your needs demand it. One downside to PeopleHR is that their servers occasionally experience downtime. Since the product is 100% web-based, this means that whenever PeopleHR's servers are experiencing issues, you'll be unable to access the system. So if having 100% availability is a requirement for your business, you may want to look elsewhere. For most businesses, these outages will be rare enough that any issues you come across will be nothing more than minor inconveniences. Given its low price point for its HR Essentials modules ($3/month), PeopleHR can be an excellent, affordable option for smaller and medium-sized businesses that are looking for a web-based HRMS.